Earlier this month, I posted some thoughts and information for Mental Health Awareness Month. 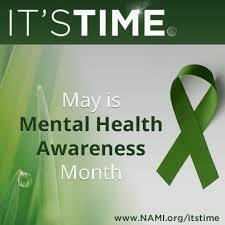 Today is the last day of the month and I hoped to speak to the issue of mental health/illness one more time. Making my own efforts to educate people about mental health/illness issues is one of my passions. I’ve known so many people who struggle with some sort of illness. I’ve shared the pain of many of those people; I don’t speak from observation only. My post Not A Unicorn told a little of my own story because I wanted to ‘come out’, so to speak. I felt a need to be honest about another aspect of who I am. Today I want to simply give more information so those who read my blog can be better educated about issues regarding mental health/illness. Whichever illness is named, from anxiety to schizophrenia, those who have a mental illness need others to understand as best they can. We can learn the difference between one illness and another. (Schizophrenia isn’t multiple personalities for instance.) People need to know that having a mental illness isn’t sin. The brain is a mysterious organ and even experts don’t know everything there is to know about how it functions. We can, however, try to get insight so we don’t put people in boxes. Boxes end up being like cages. In a recent Facebook post, I included a link from Ed Stetzer’s blog. Stetzer is one of my favorite bloggers because he doesn’t tend to be a Fraidy Cat. He speaks truth and speaks it well, without throwing stones. His post addressed how the Church needs to better handle mental illness issues inside and out. Last week, I had the privilege of listening to my pastor preach on depression in the sermon series Insomnia: What Keeps You Up at Night? Pastor Bray interviewed a local Christian counselor, a member of our congregation. I can say there have been few times in the almost 18 years I’ve attended my church when I felt as grateful as I did that day for God speaking through his people. I hoped that from their interview, which was grace-filled and educational, everyone present would take away at least one fact that would help them to better understand depression and other mental illnesses. My church isn’t so unique. I’m sure there are others that extend grace to people who struggle with mental illnesses. We need the Church to come alongside us. If you want to educate yourself on mental illness, the Internet is a fount of information. Simply do a search on mental illness or a specific topic you have questions about. Listed below are some links to help you get started.